Summertime salads are one of my favorite things next to fresh berries. Tender leafy greens are so fresh, crisp and colorful. All the reason to eat copious amounts of salad and to take advantage of their seasonal abundance. Famers markets are full of all summer has to offer right now. Before leaving for Texas, I whipped up this salad with fresh greens from the farmers market to share with ya’ll while I was away from my home on Whidbey Island for a few weeks. Fresh Okra (!! ), which we promptly grabbed and shoved into a big ole’ pot of black eyed peas. Mmmm mmmm. Watermelon, currently eating in big spoonfuls. Cucumbers, one of my favorite things about summer! And oh my goodness, we even found a vendor that offers fresh vegetarian and vegan tamales! We scored big and brought a ton of them home! Have you found your nearest farmers market? If not, check out Local Harvest to find the one closest to you. They make it easy to search by zip code, so even if traveling this summer, there’s still a way to eat local! I usually tend to over-by at markets though, so I have to restrain myself or plan accordingly. There’s so much inspiration! 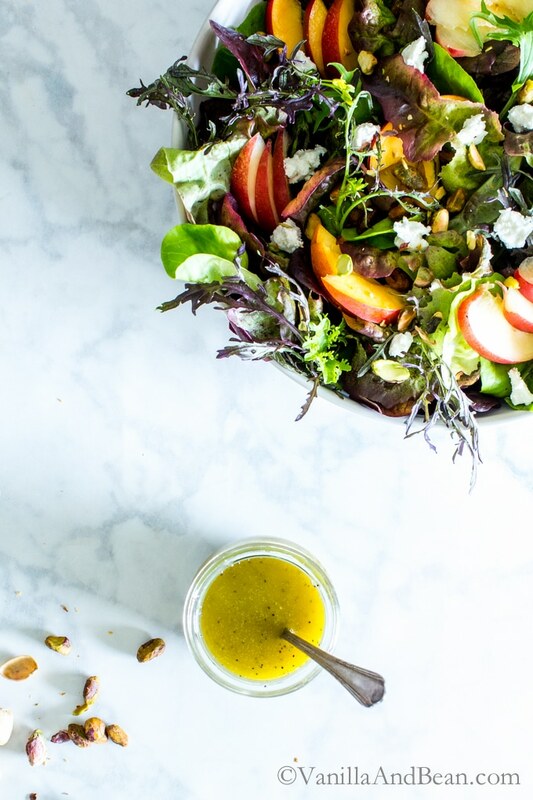 Nectarine, Pistachio and Goat Cheese Salad with Honey Dijon Vinaigrette is versatile. The dressing pairs with so many ripe fruits and berries. Besides nectarines, strawberries, blueberries, cherries and/or black berries can be added or subbed. 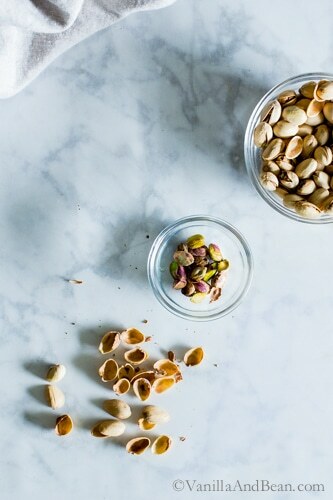 Walnuts, pecans or almonds can stand in for the pistachios. Gorgonzola cheese would make a delicious sub for the goat cheese too. The dressing can be made ahead and stored in the refrigerator for up to two weeks. 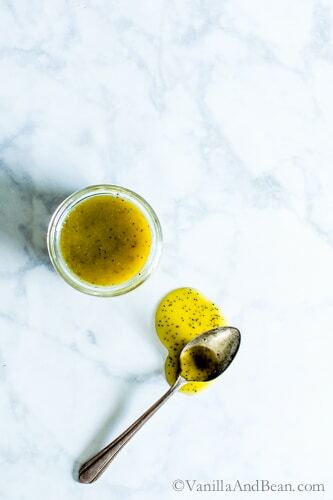 It’s a fabulous dressing to have on hand for summer salads. Get em’ while their fresh y’all! 8 C (120g) Fresh Tender Lettuce Greens such as bib, red leaf, romaine. 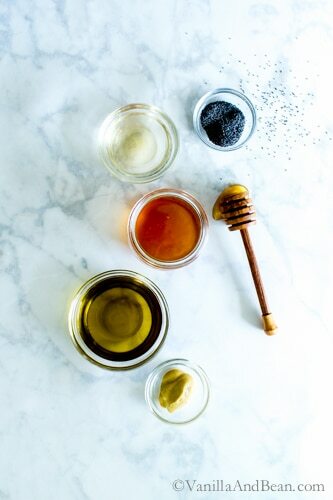 In a lidded jar, add the honey, olive oil, vinegar, mustard, poppy seeds and salt. Shake until ingredients are emulsified. Taste for seasoning/sweet adjustment. Store leftover dressing in a lidded container at room temperature and use within a few days. For longer storage, refrigerate for up to two weeks. Bring to room temperature before dressing the salad. Soak the greens in cool water for about five minutes. Drain and rinse throughly. Tear into bite size pieces. 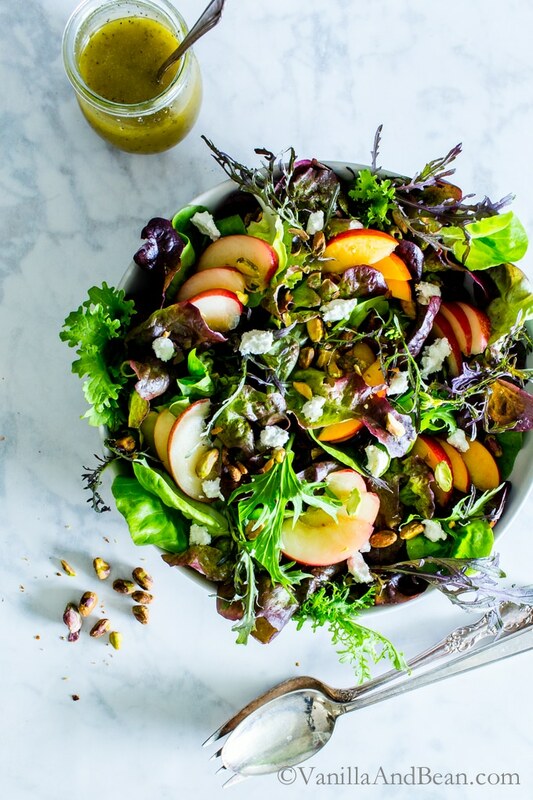 Arrange the nectarines on the salad and top with goat cheese and pistachios. Toss with dressing just prior to serving. Ooooh so refreshing, juicy and sweet! I hope you enjoy it Laura! Fruit + cheese + nuts/seeds is the perfect salad combination – this one looks so delicious! It makes me excited for when peaches are in season here… hopefully only a few weeks more to go! Peaches would be a fabulous sub for the nectarines, Chelsea. WA grown peaches just started making an appearance… we wait all summer for this! (Watermelon too!) I hope you enjoy the recipe! I haven’t been able to find many nectarines (which are my favorite) but we do have some local peaches that would make a nice sub in this recipe. I love the sound of the poppy seed dressing with the crunch of the pistachios. Such a delightful combo! 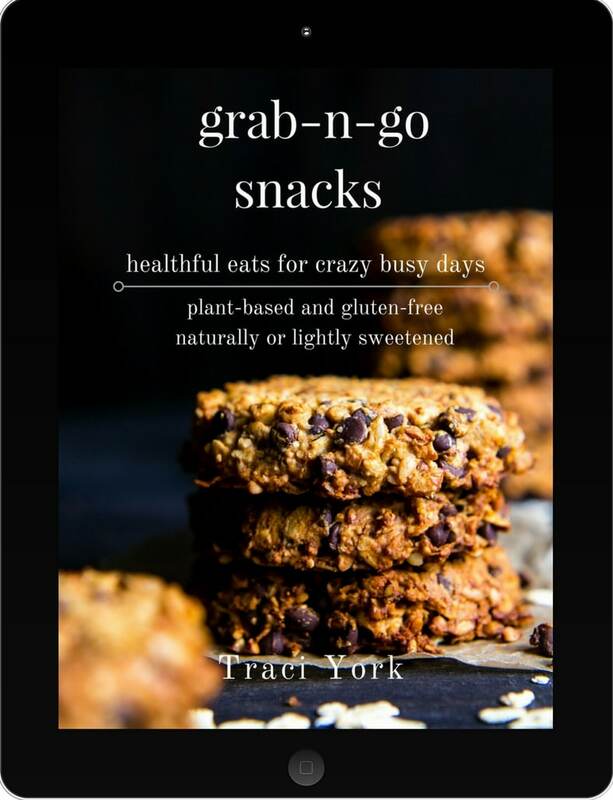 Can’t wait to try this one, Traci! LOL – so true, Sarah! Then I run out of room in my freezer due to berry overload! 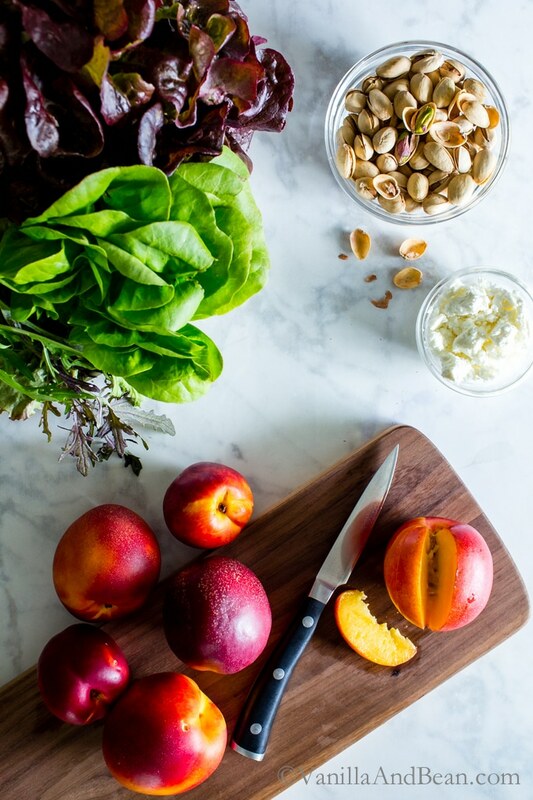 Peaches would be brilliant on this salad… I just tried cherries and love it! Such a beautiful and summery salad! This salad is almost too pretty to eat! I mean, absolutely gorgeous!!! Yet another of your recipes has jumped right on to my menu! I can hardly wait to make this, and share it. Brilliant! Thank you for your kind words, Greg! I hope you enjoy it! What a gorgeous salad, Traci! 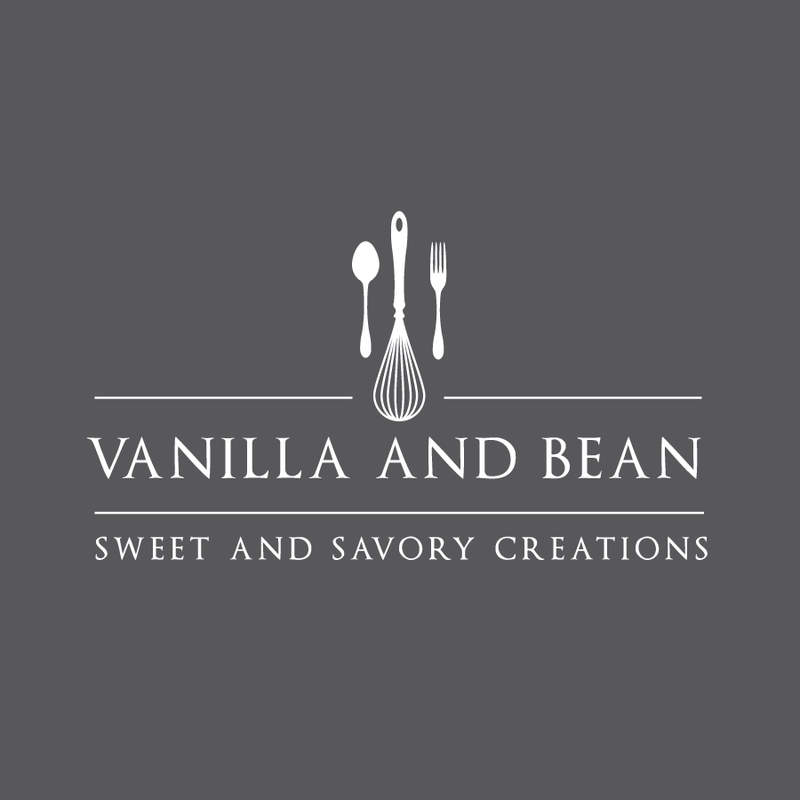 I love everything in there – fruit, nuts and goat cheese – yes, please! My local farmers market has been my backyard this year – All the veggies have been growing like crazy! Have fun in Texas and stay cool! I’m with ya Geraldine! So much summer goodness. I looove your backyard garden… just incredible! I’m certain you’re roasting tomatoes about now! Delicious! I will try it. I also love grilled pineapple on salad. Whidbey temperature is perfect right now. But the pool in Texas has me a bit envious! Oh wow Heide! Grilled pineapple! That sounds fabulous. I gotta say, the pool is nice… enjoy that cool Whidbey breeze! Oh my dear.. What a gorgeous summer salad this is. I am such a fan of using fruits and nuts in my salads and I cannot get enough of these during the summer months. Beautiful mouthwatering photography as always. Thank you Aysegul! I love them too… so many combinations and textures. Nectarines are all over the place and I love it! What a gorgeous salad Traci! 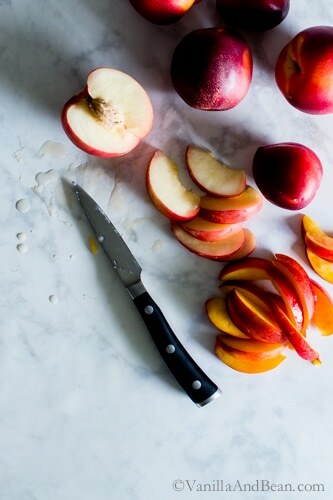 Nectarines are always a summer favorite. I also love the pistachios and goat cheese in this one. We’re roasting here too, 98 degrees yesterday! Ugh! Enjoy your time with your family! Oh you hit all of my favorites with this one…and the dressing sounds like the perfect addition. I’ll be using this with all of the fruits of the summer. Thanks, Traci! Enjoy your time with Mom! Yum! This looks like a great salad for beating the Texas heat. 80 degrees for the low temp this morning is not the way to start the day! We’ll have to try this one soon. Agreed, Tom! I melted this morning on my walk :D I hope you enjoy the salad! 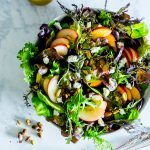 Nectarines, goat cheese, and pistachios are three of my all time favorite salad ingredients, so you really hit it out of the park for me with this one! You’ve got me drooling over salad at 7am :) Pinning! Me too Medha! Those salty pistachios are lip smackin with that goat cheese. A 7 AM salad sounds good to me! Thank you for pinning Medha! I love simple summer salads like this! Isn’t summer produce the best? Me too Karen! It is the best! The flavor profile of this salad is fantastic! The summer tastes sound so yummy and refreshing!